A fungus-farming ant colony is a complex society with division of labor among many size classes. 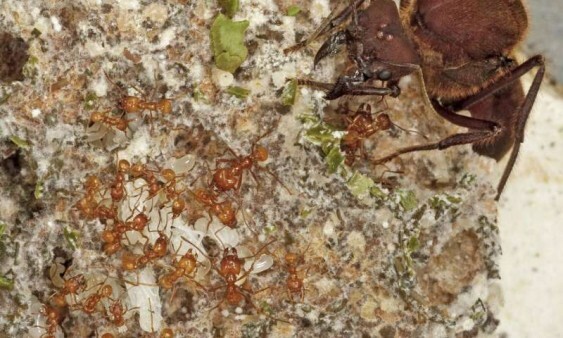 In this close-up, tiny nurse ants tending to white ant larvae are dwarfed by the queen ant in the upper right. All the ants feed upon protein-rich food produced by a white-grey fungus that they cultivate underground. The fungus decomposes fresh, leafy greens brought underground by leafcutters, which can defoliate whole trees to feed the colony. Credit: Karolyn Darrow. A group of South American ants has farmed fungi since shortly after the dinosaurs died out, according to an international research team including Smithsonian scientists. The genes of the ant farmers and their fungal crops reveal a surprisingly ancient history of mutual adaptations. This evolutionary give-and-take has led to some species–the leafcutter ants–developing industrial-scale farming that surpasses human agriculture in its efficiency.